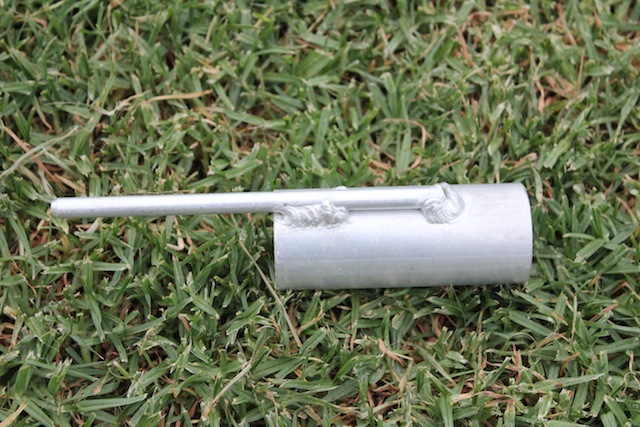 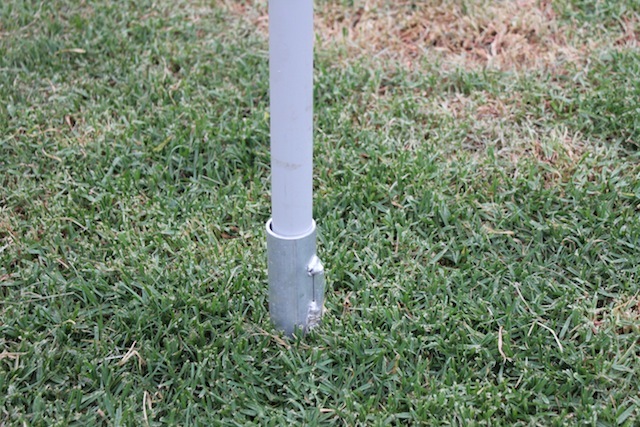 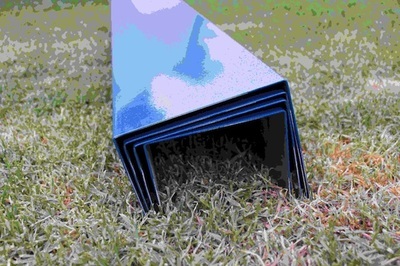 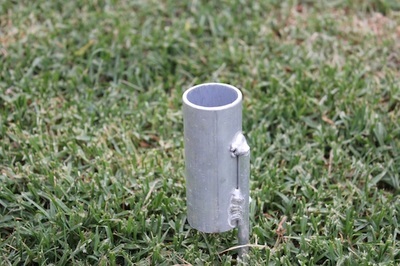 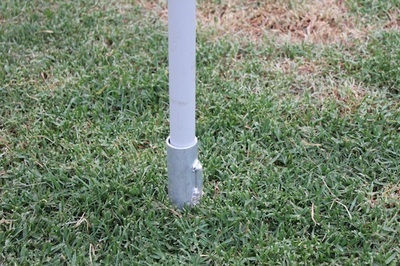 Comes with two aluminum uprights and pvc pole. 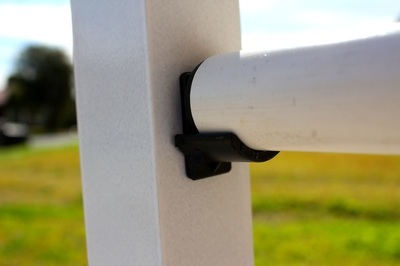 Clips for heights are attached, clips are from 'Cleanrun' and are made from pvc. 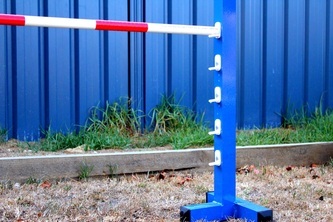 Heights are all ANKC standard. 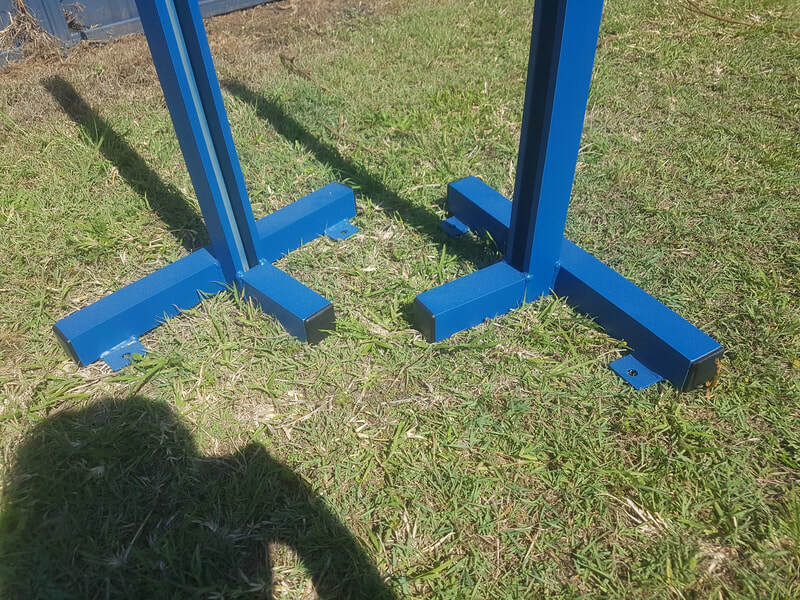 Lightweight, hollow uprights and base. 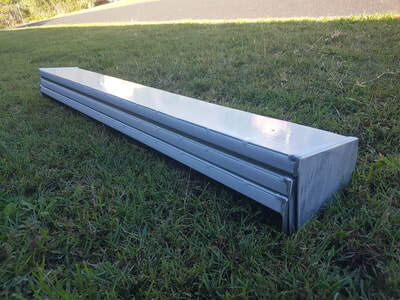 Plastic end caps for base and uprights included but may change in style depending on availability. 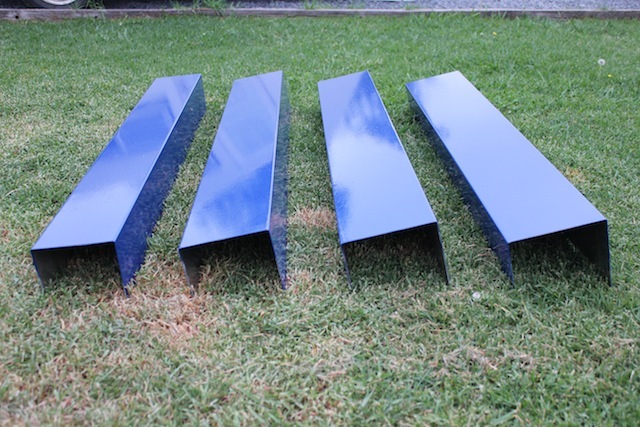 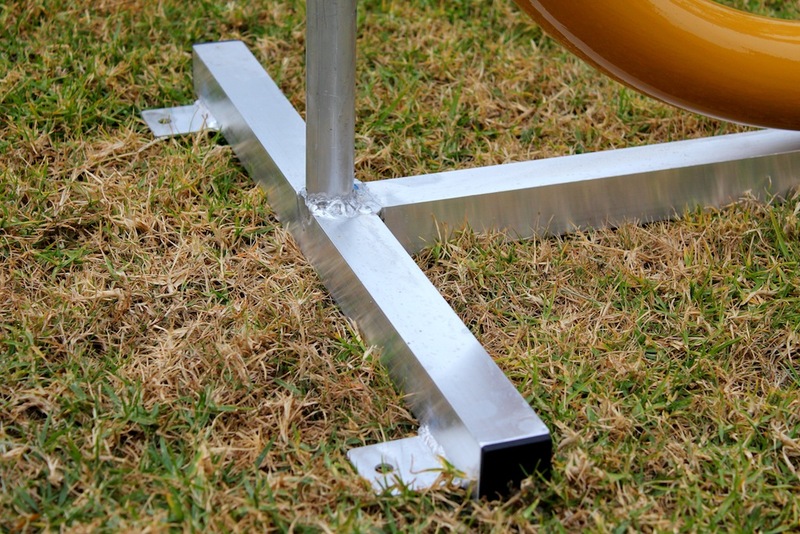 Lightweight aluminium stand alone wings with hollow uprights and base. 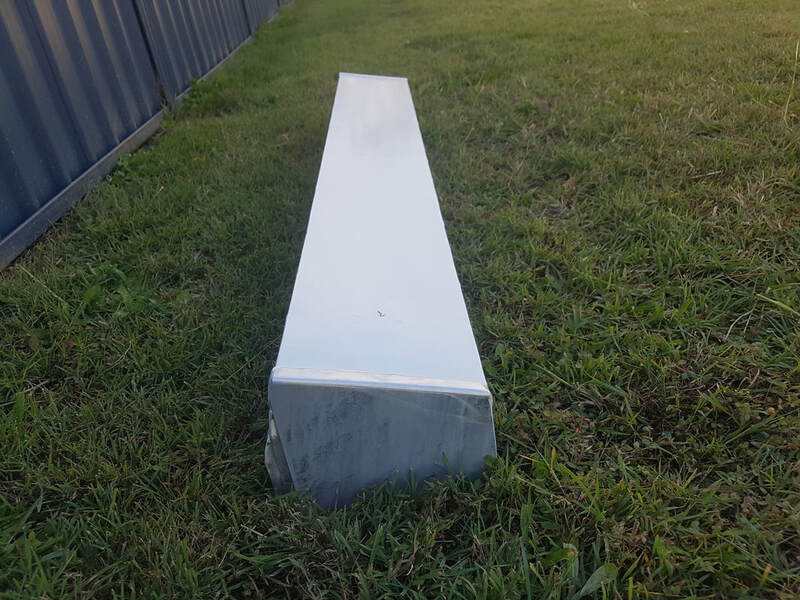 Plastic end caps for base included but ﻿may change in style depending on availability. 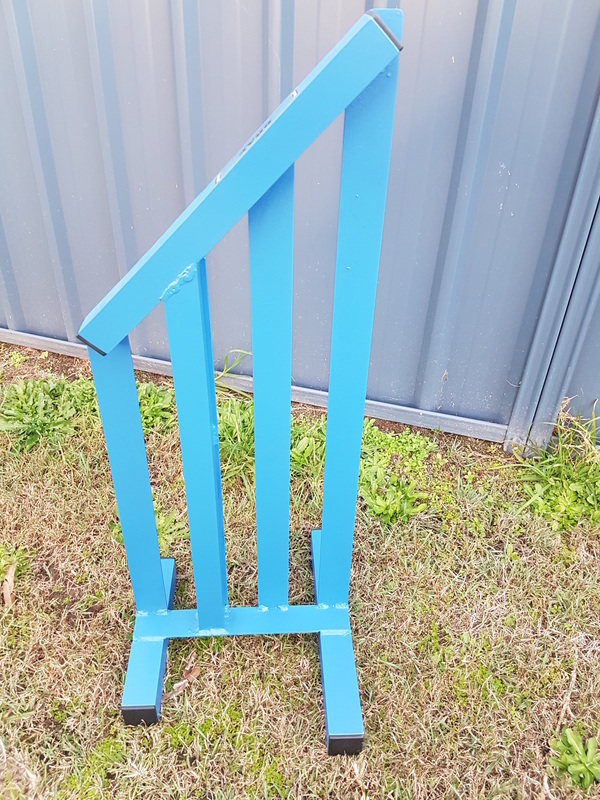 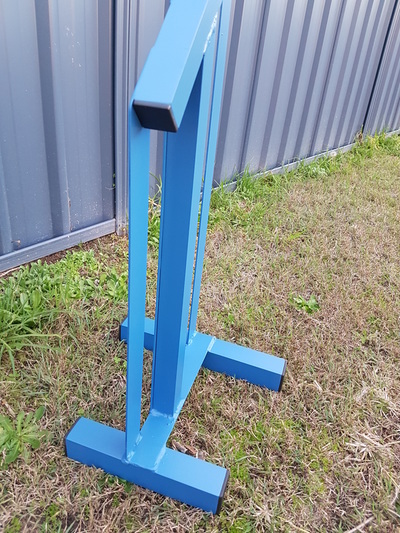 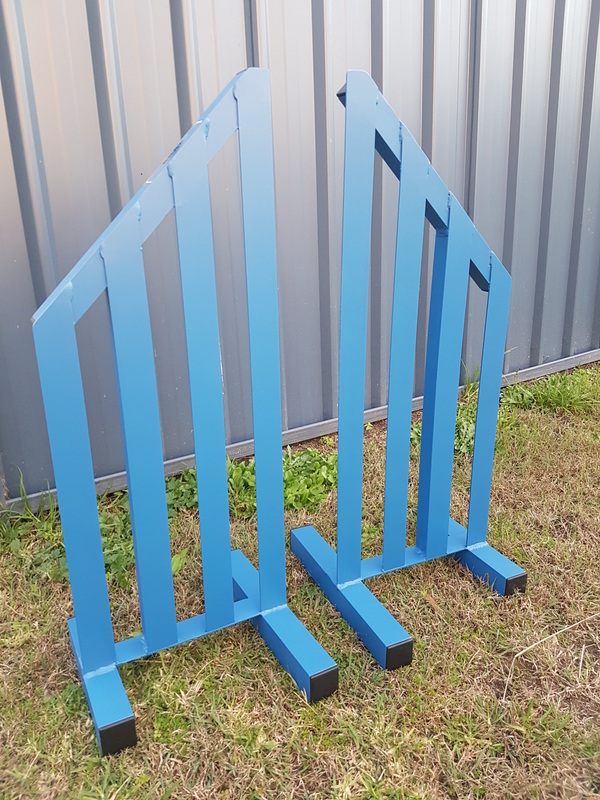 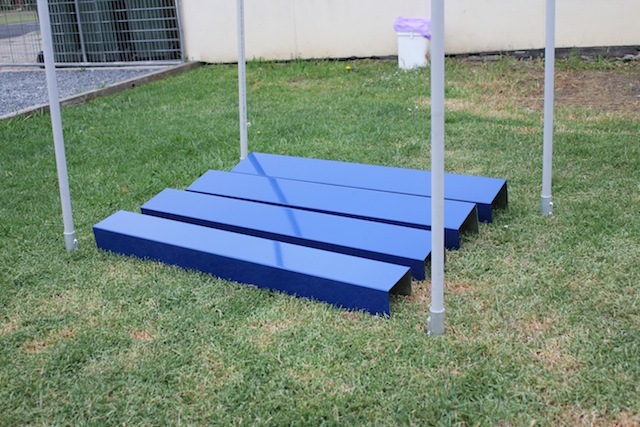 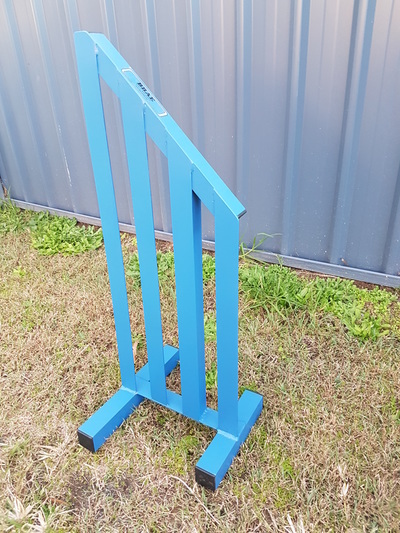 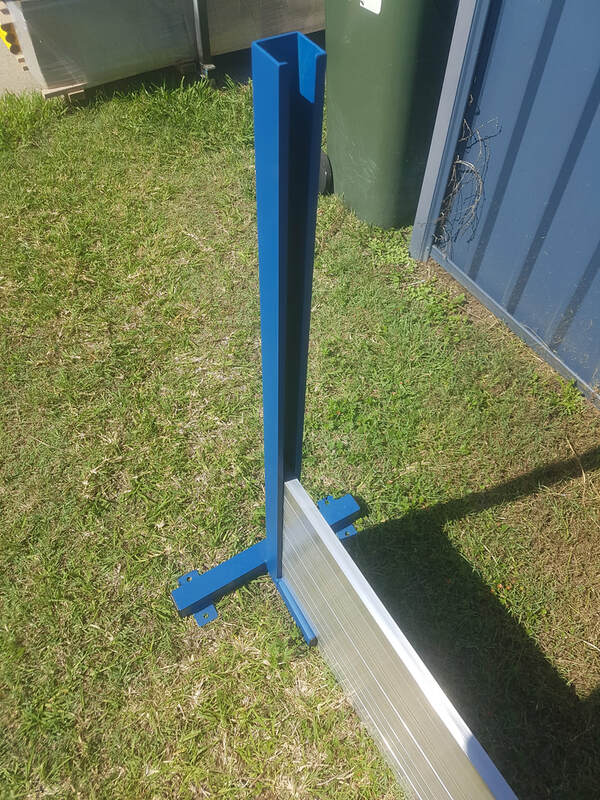 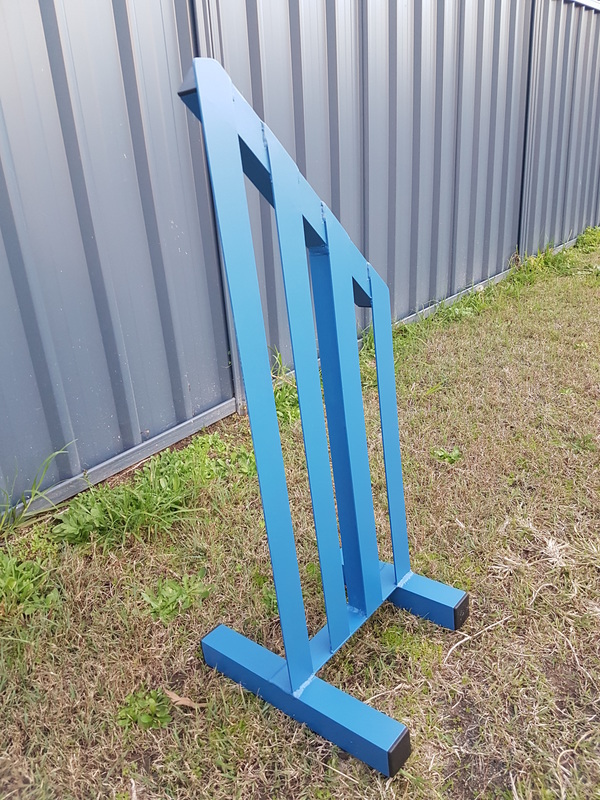 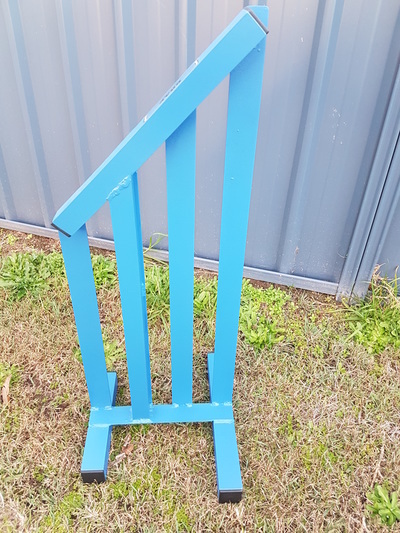 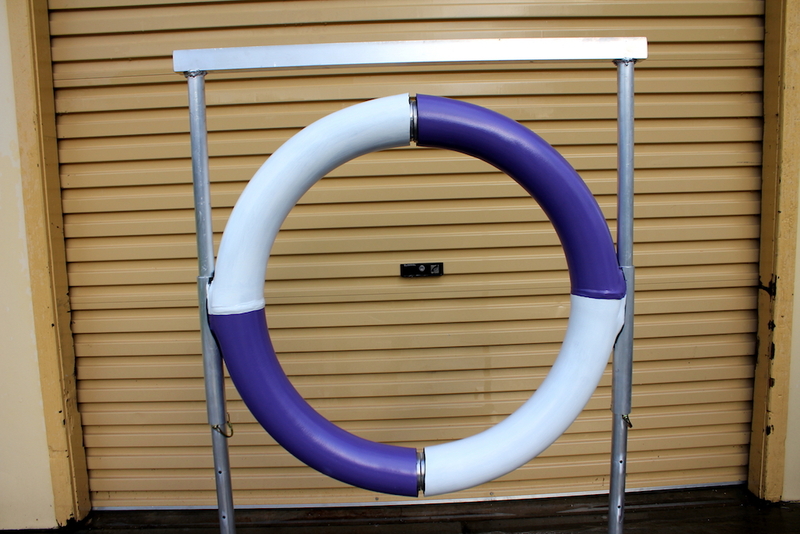 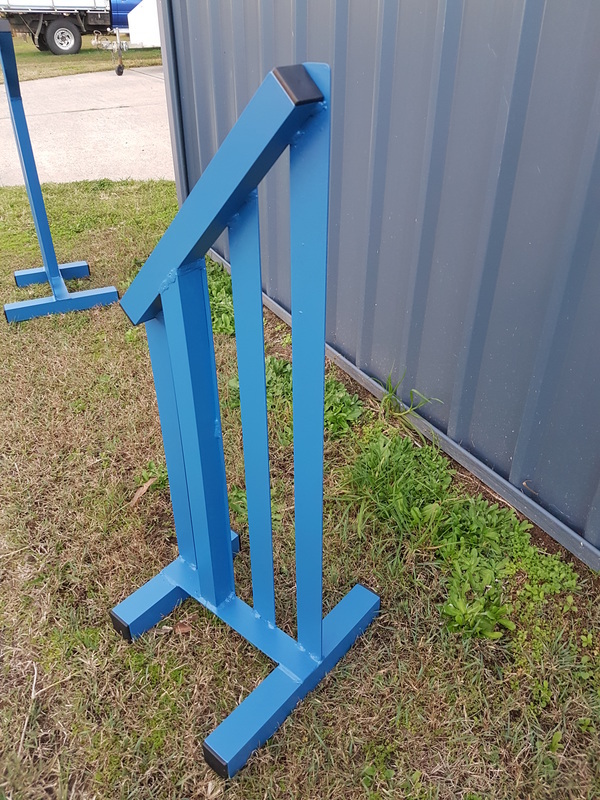 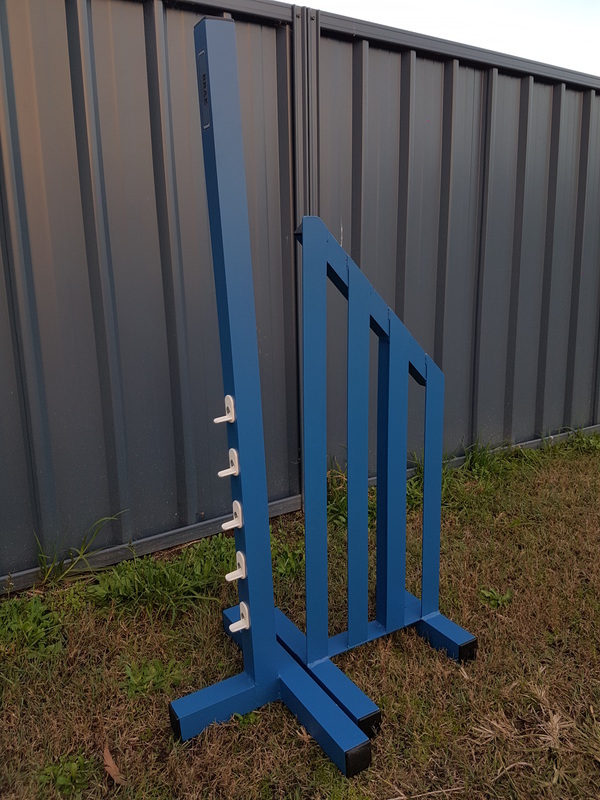 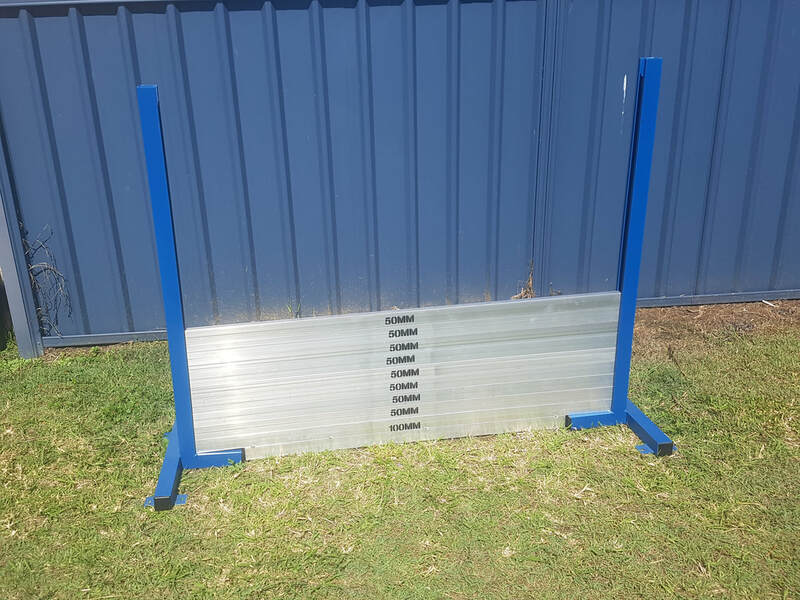 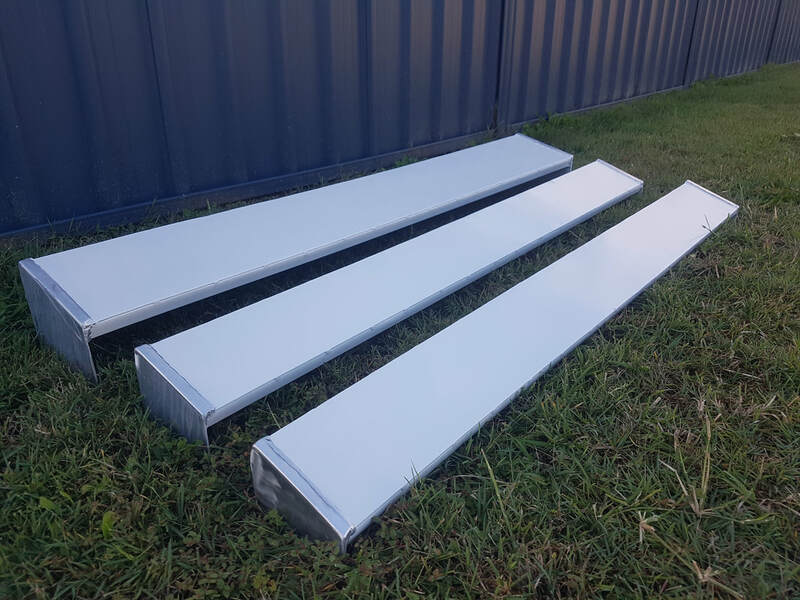 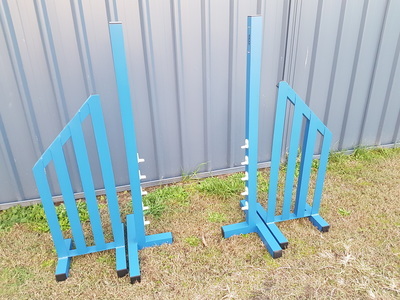 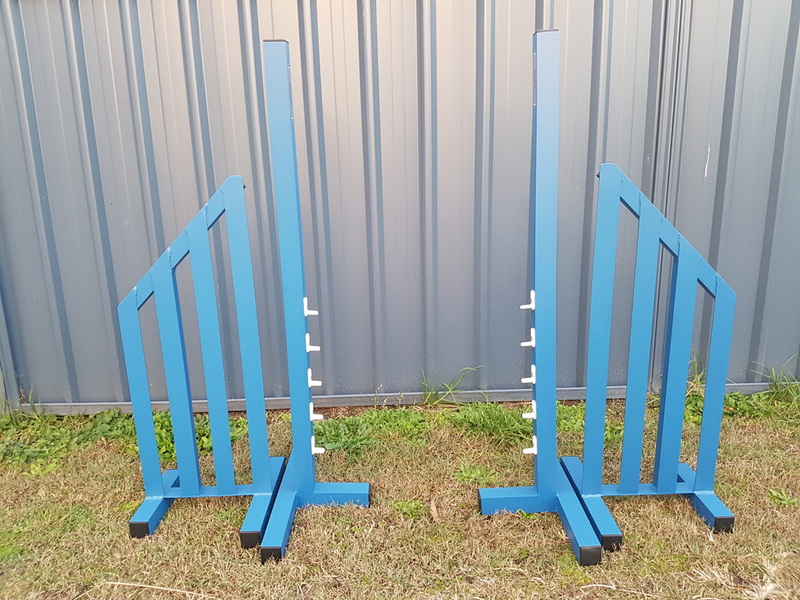 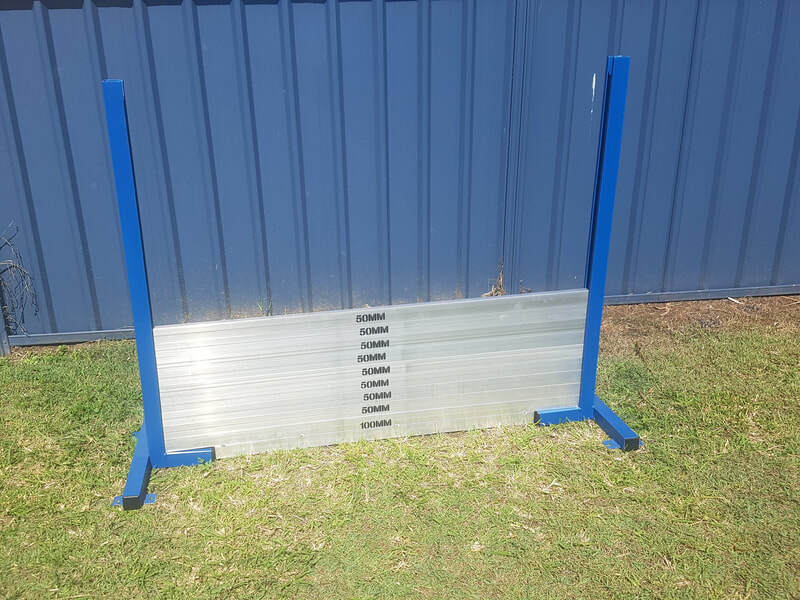 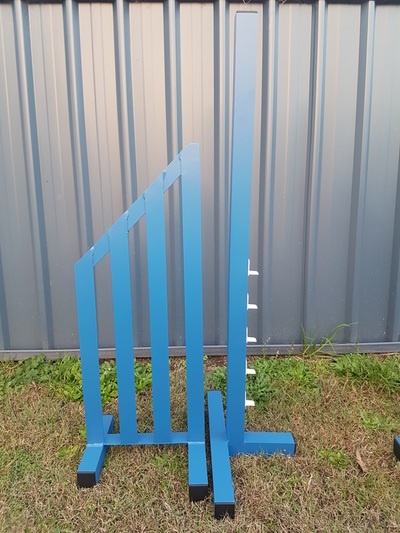 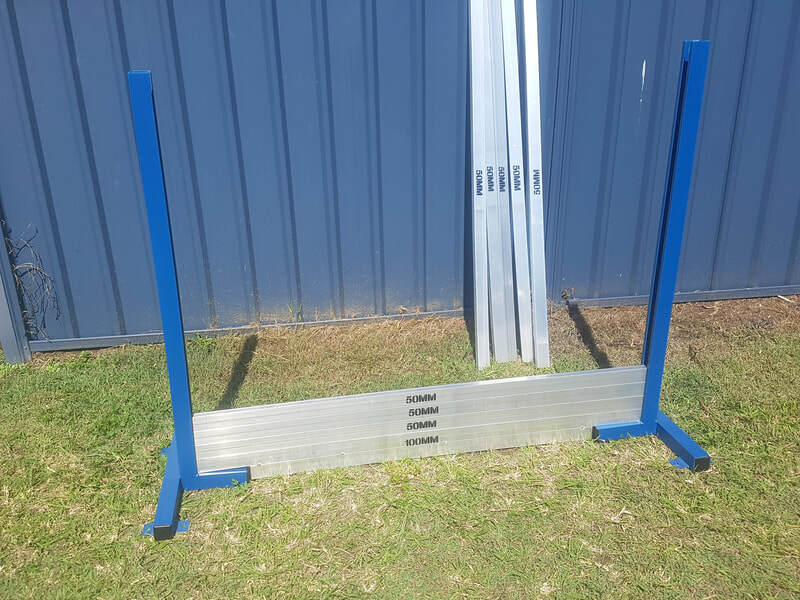 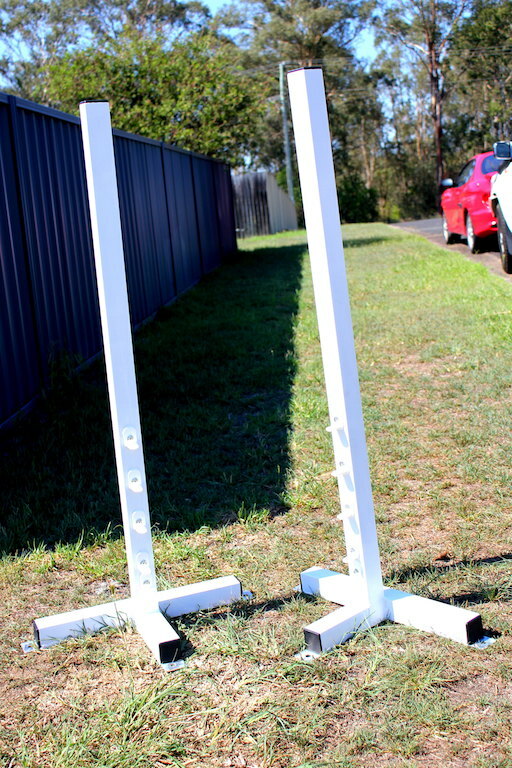 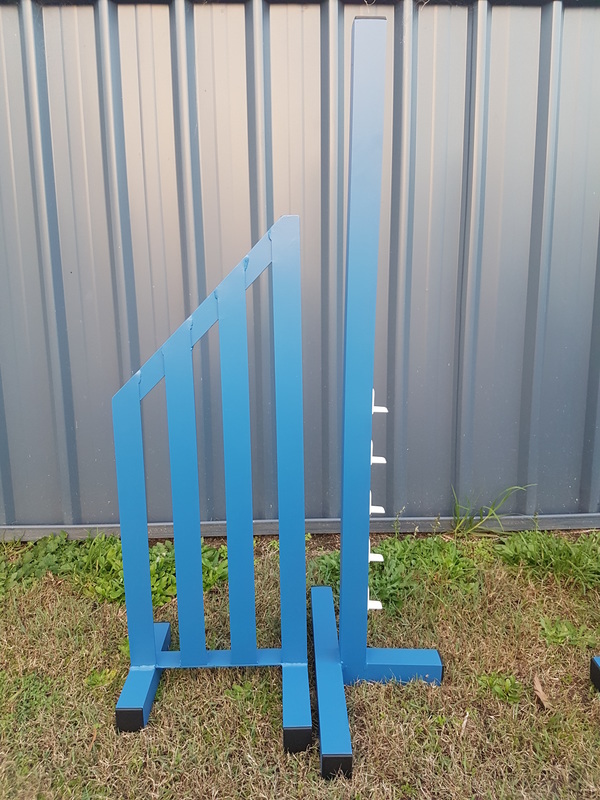 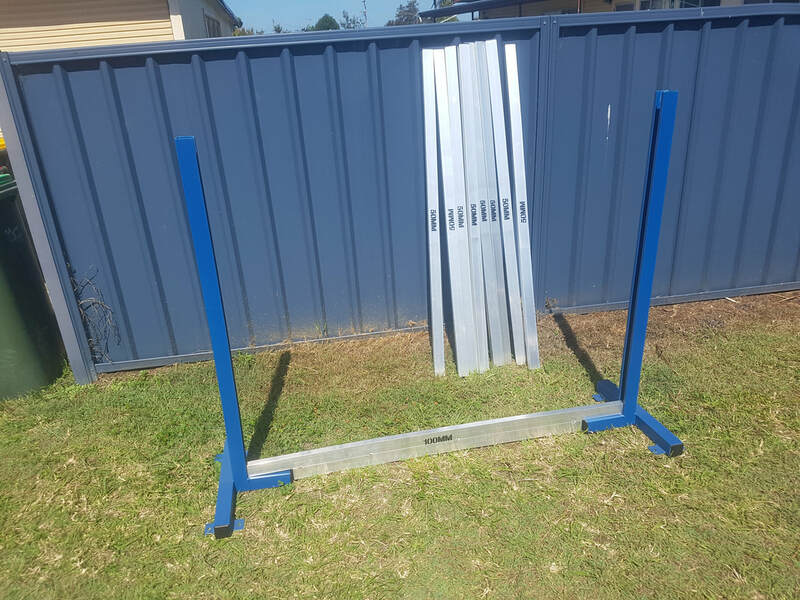 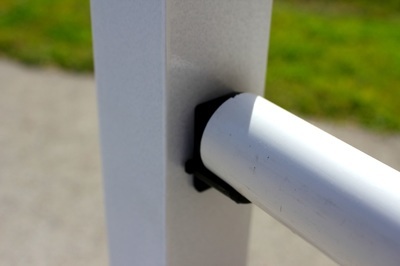 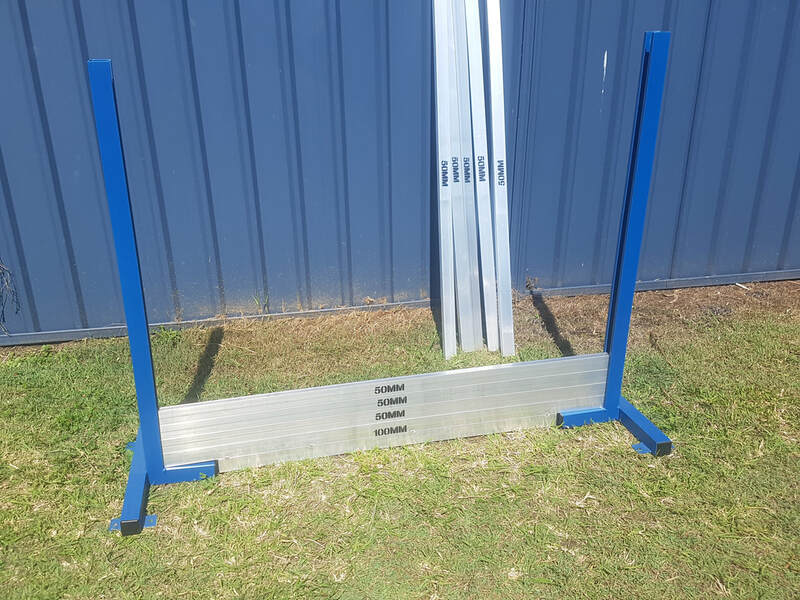 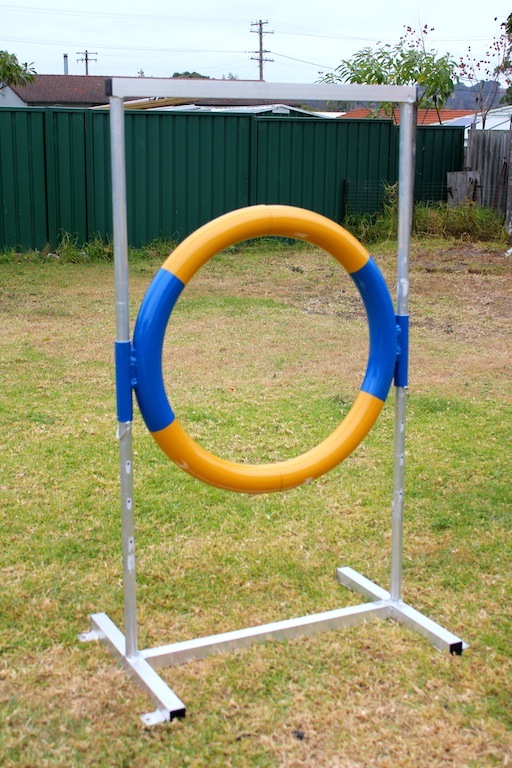 ﻿﻿﻿Light weight aluminium Stand Alone Wing and Hurdle Combo. 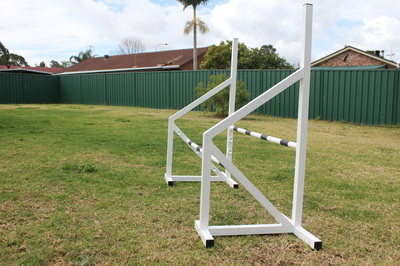 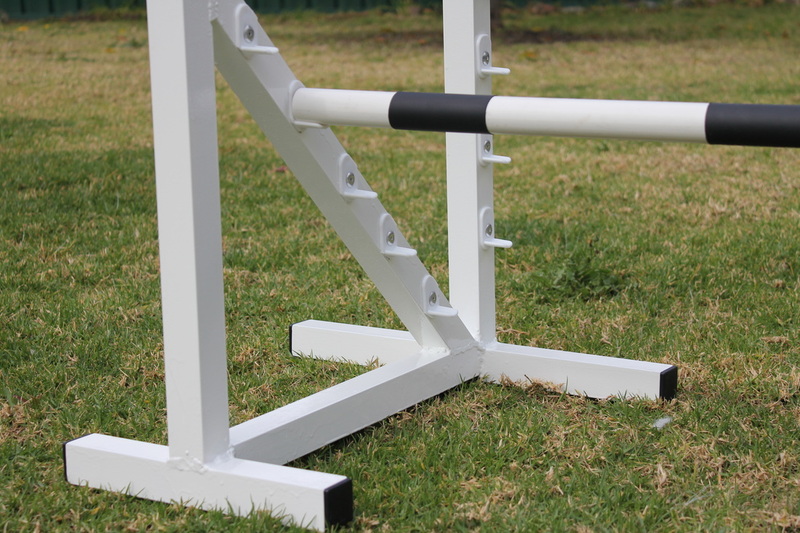 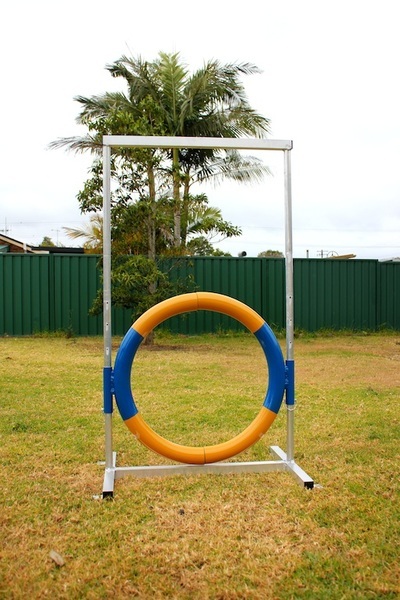 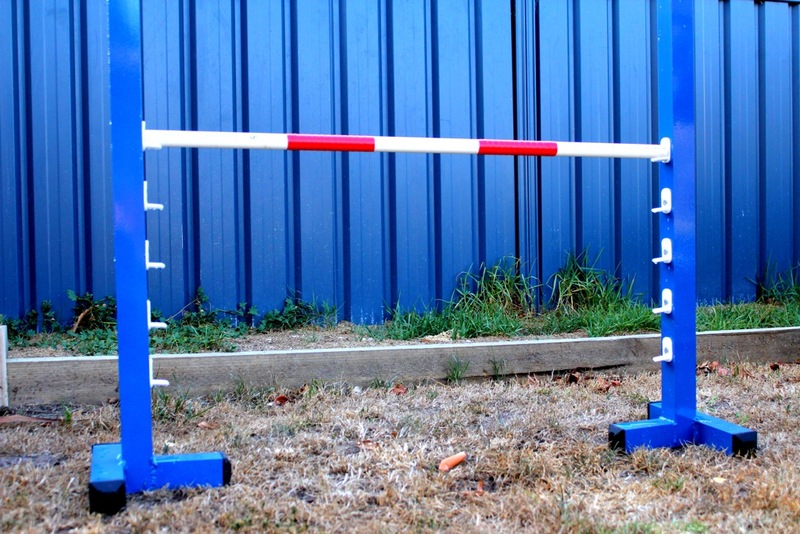 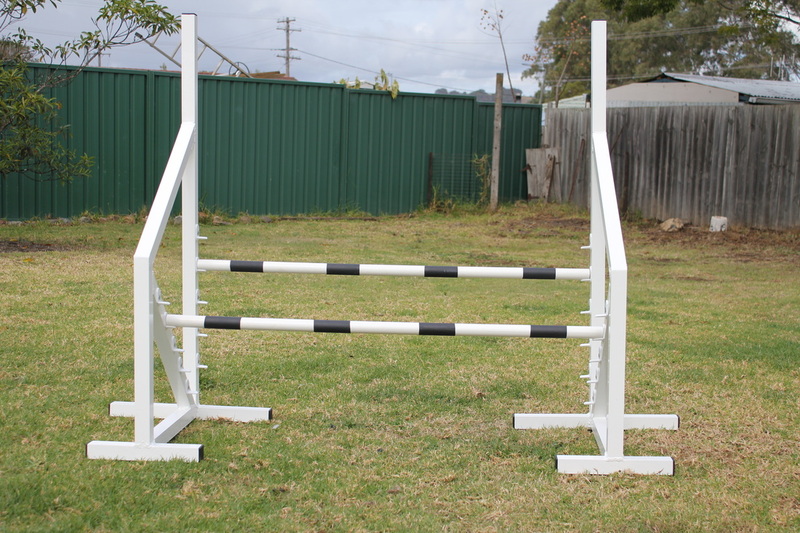 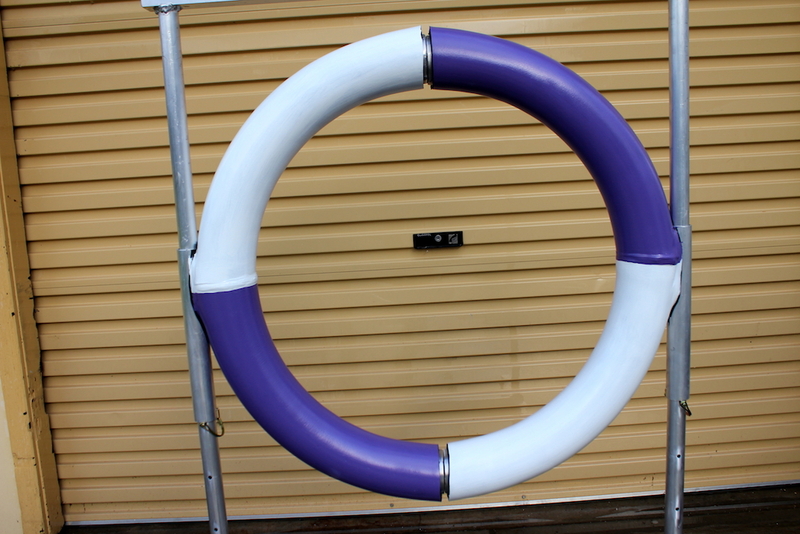 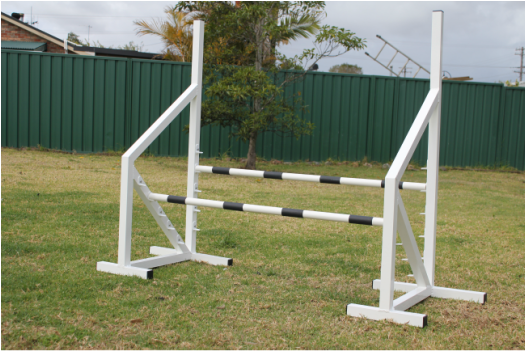 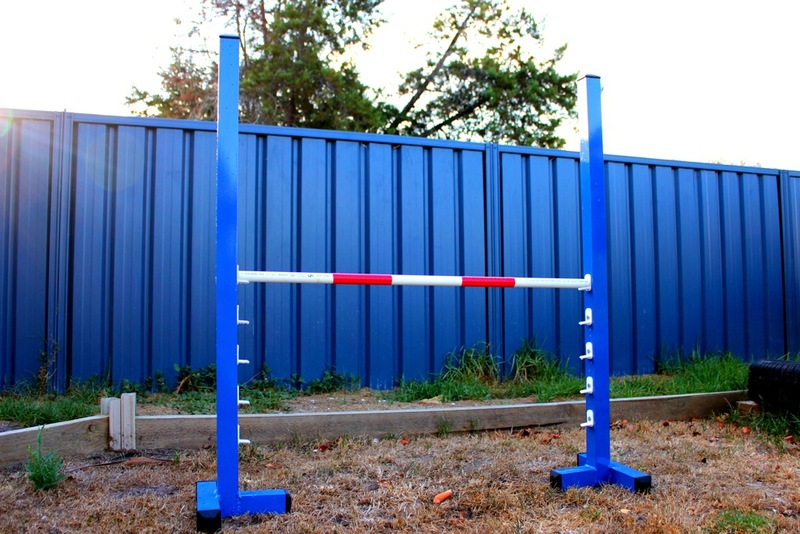 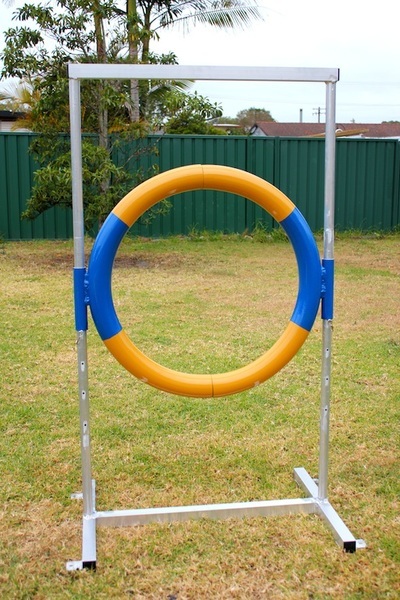 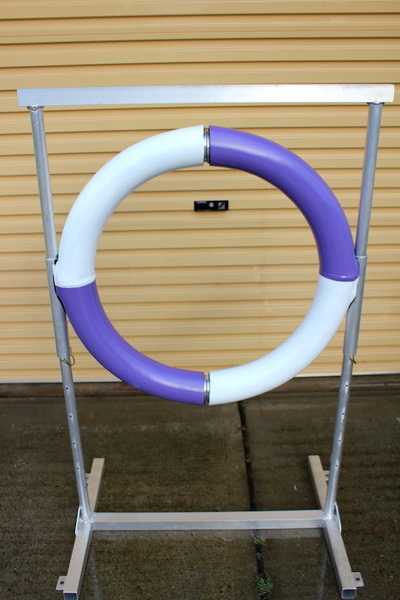 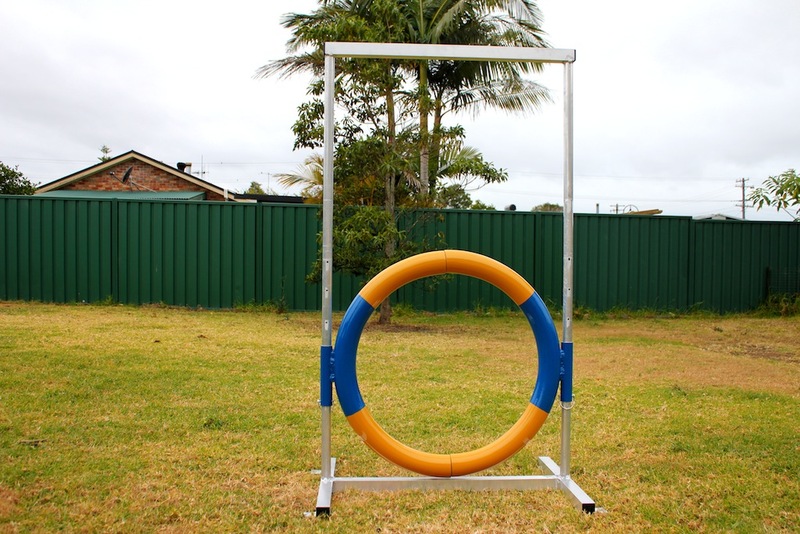 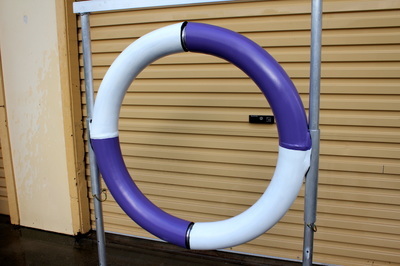 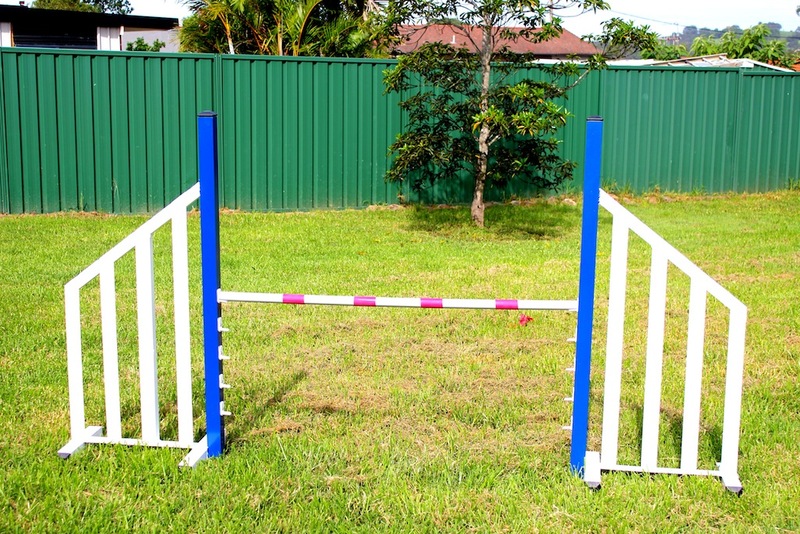 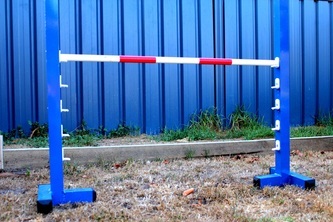 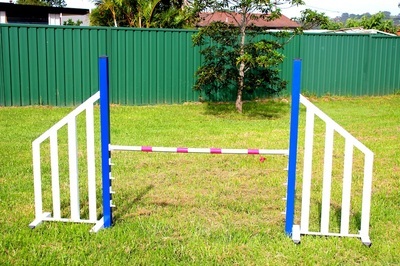 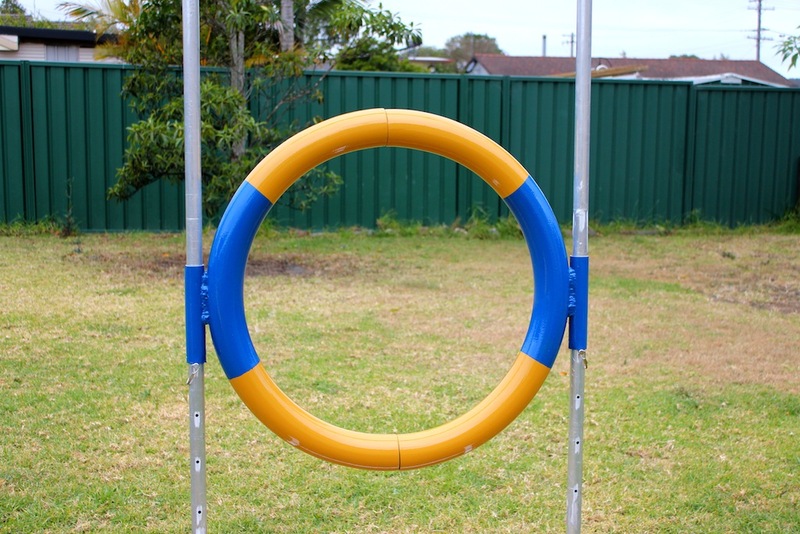 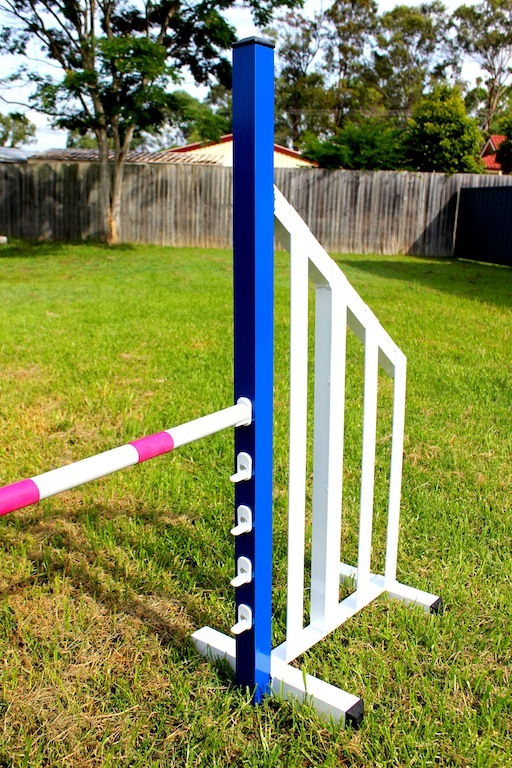 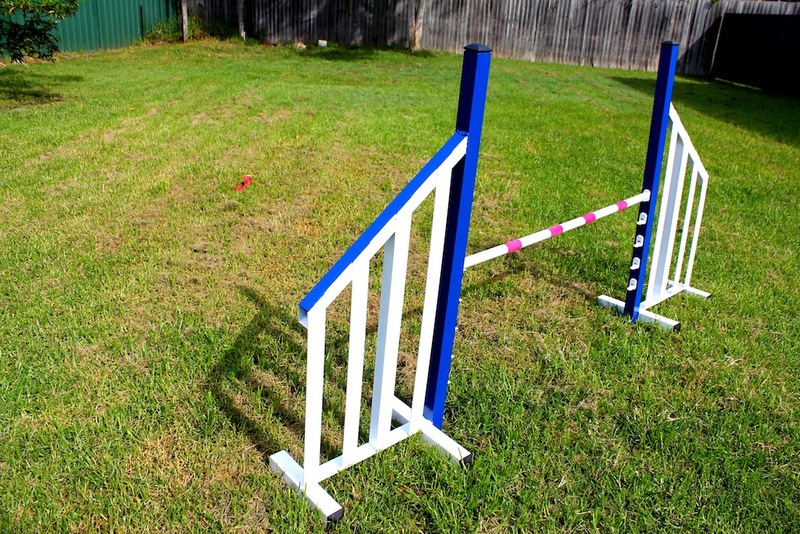 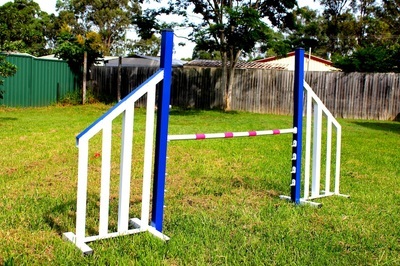 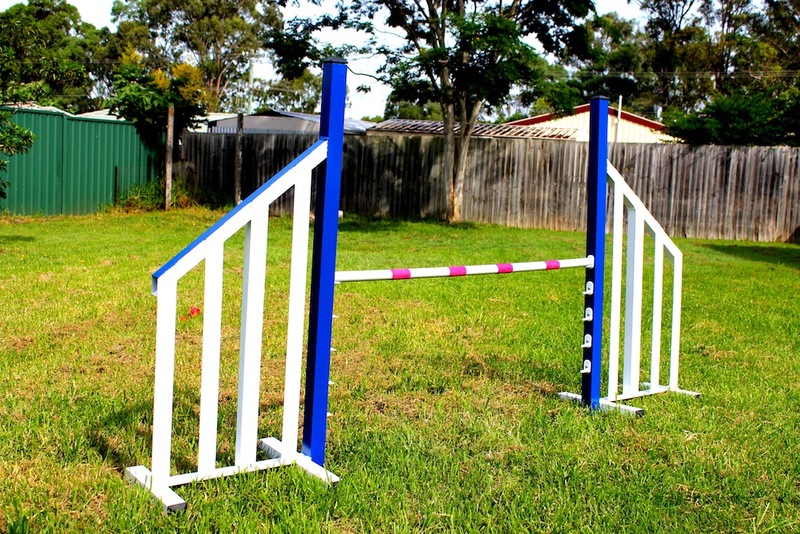 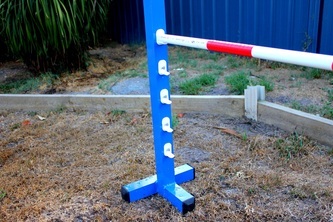 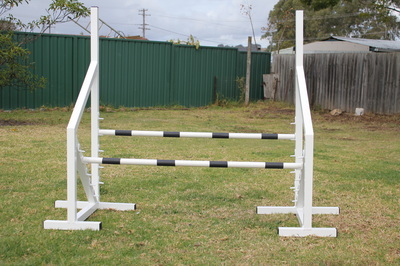 The perfect training hurdle which gives you the option of a winged jump or a standard hurdle. 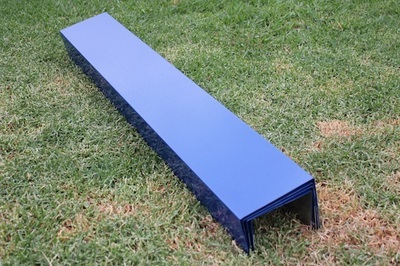 ﻿Plastic end caps for base and uprights included but may change in style depending on availability. 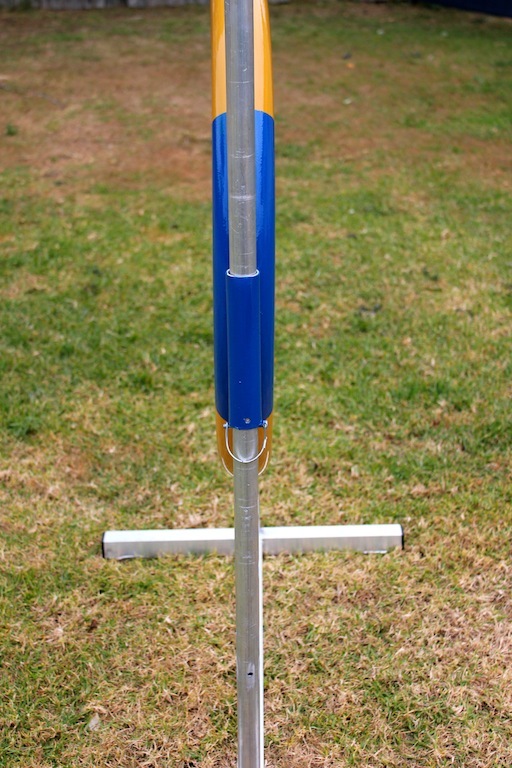 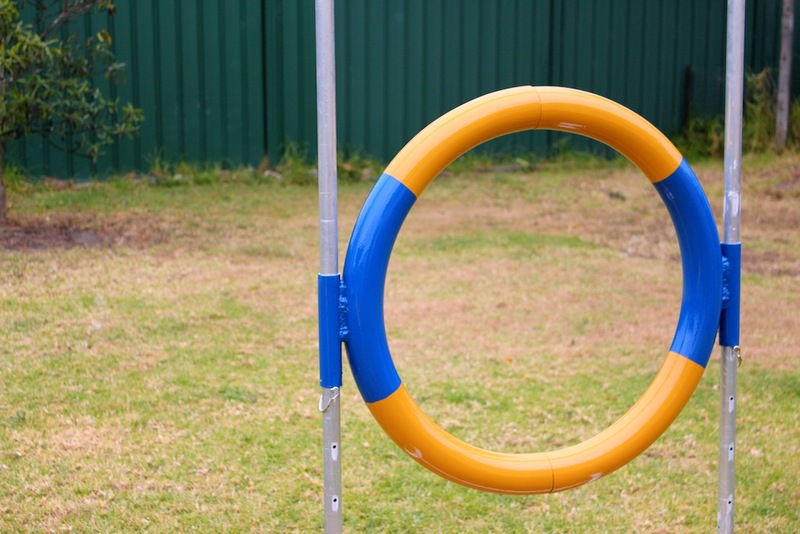 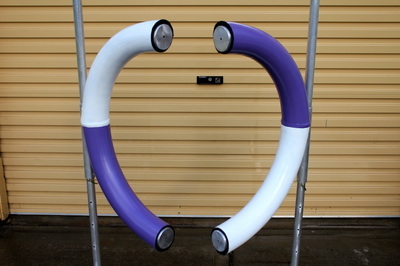 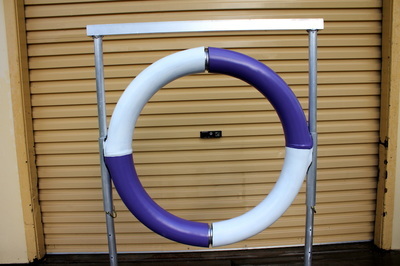 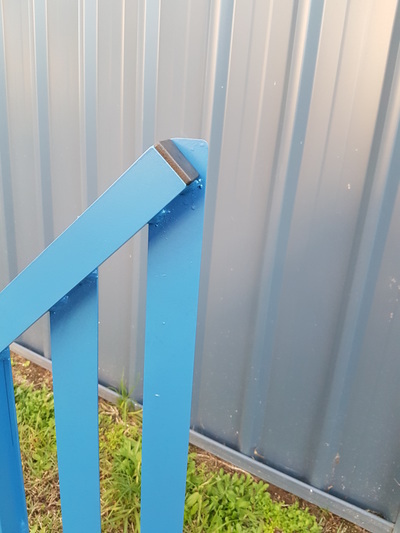 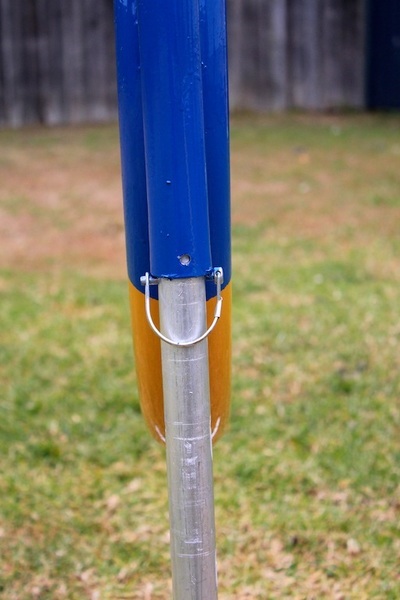 Light weight aluminium winged hurdle with pvc clips and end caps. 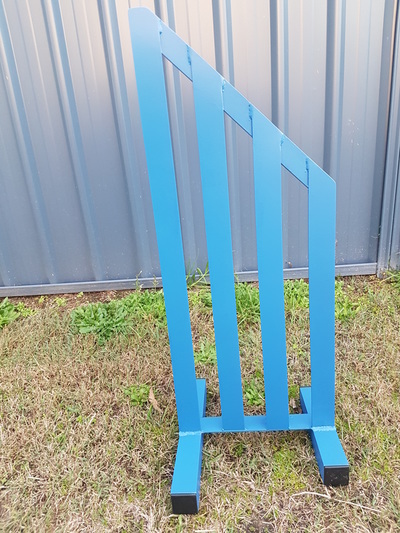 Painted in one or two tone colours. Includes four sturdy, light weight folded aluminium panels. 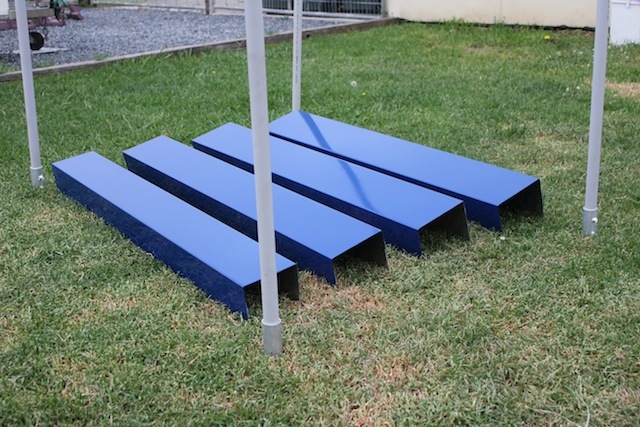 The four individual panels neatly pack on top of one another for easy storage and handling. 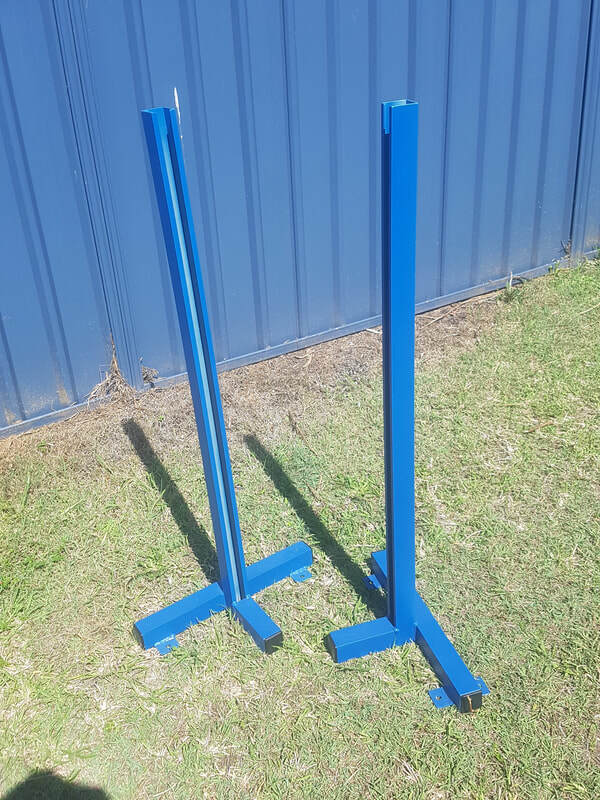 Available in your choice of Blue or Yellow. Made from lightweight aluminium our new spread jump separates into two halves to make it easier to transport and store. 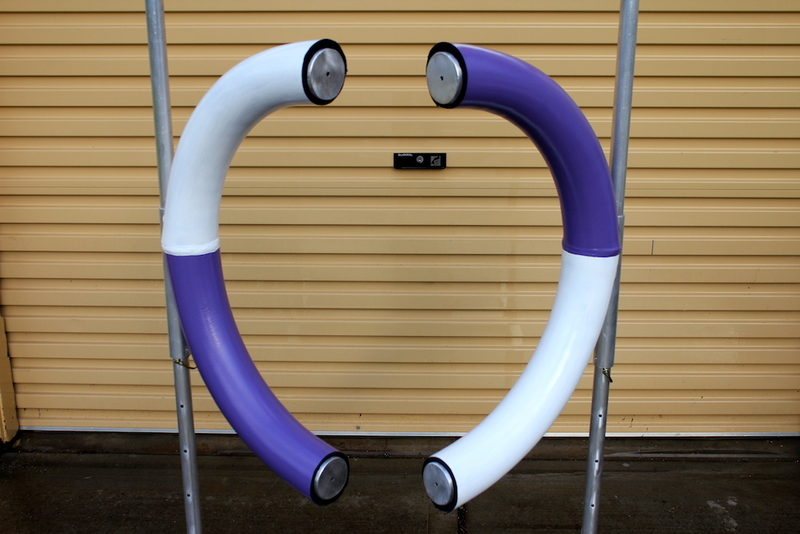 BBAE is happy to present our new break away tyre, no chains, no cords or cables. 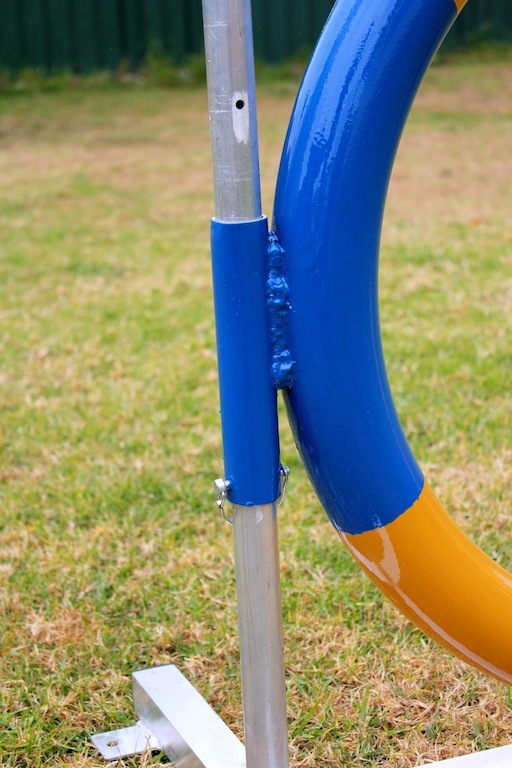 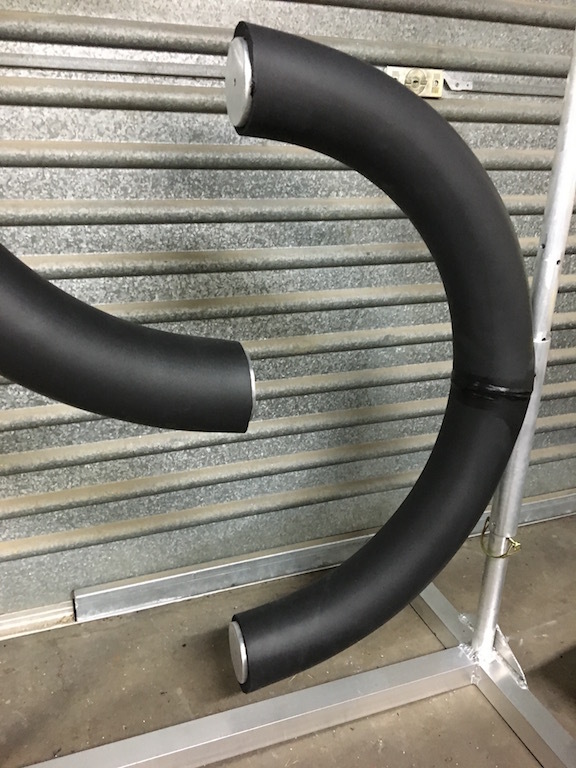 Our new tyre design is made from one piece aluminium hollow pipe, lightweight durable and simple to use. 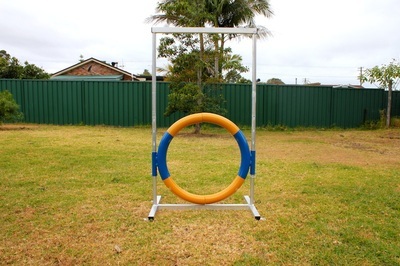 Please see the below video which demonstrates its use. 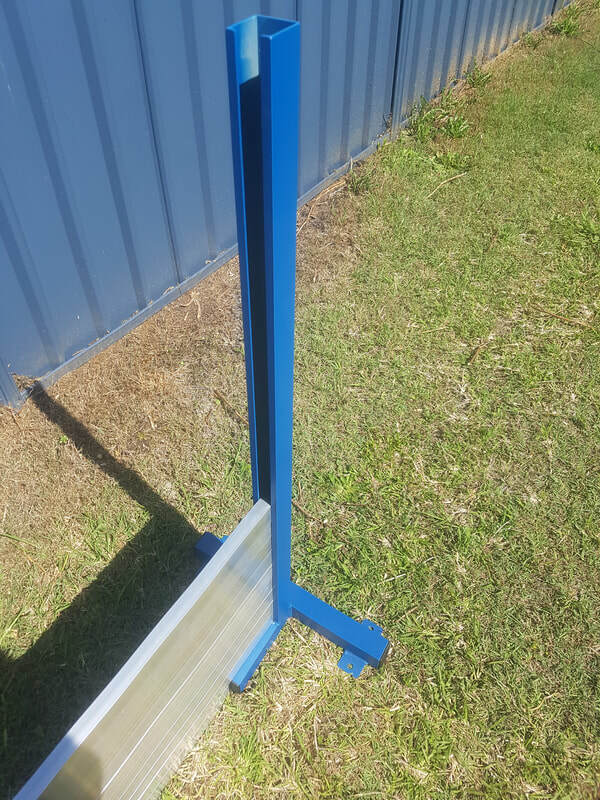 Stand/Frame: sold complete with Tyre. 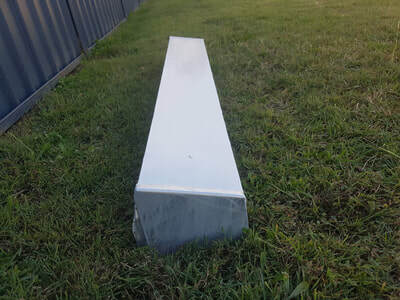 Post end caps included but may change in style depending on availability. 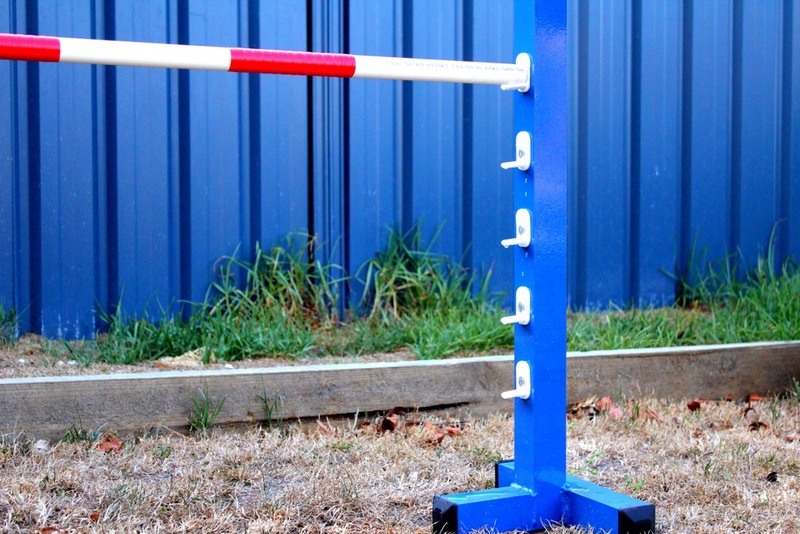 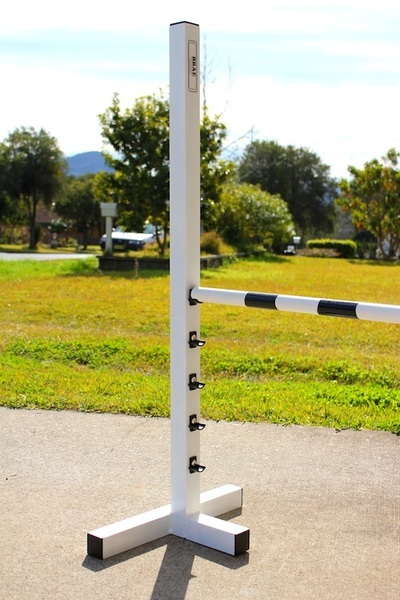 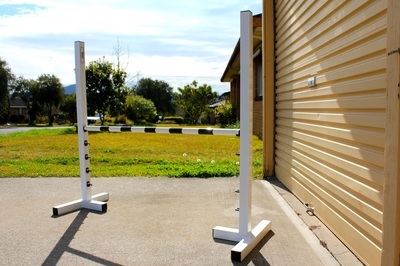 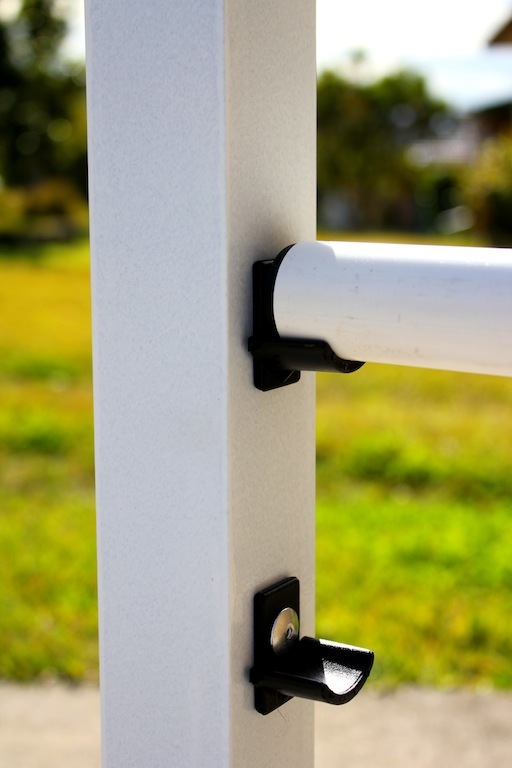 Our Aluminium Obedience Solid Jump Is simple to use and light. ​Height can be increased in 50mm increments from there untill you reach the maximum height of 500mm. 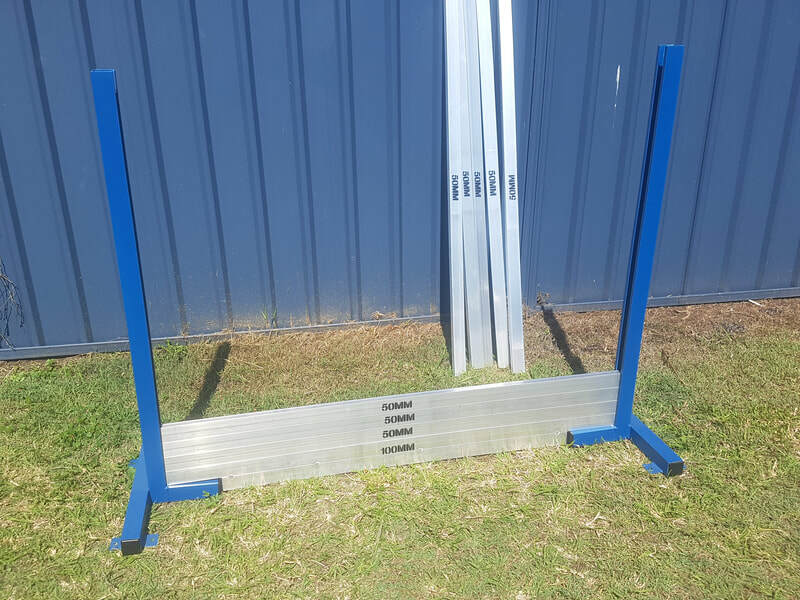 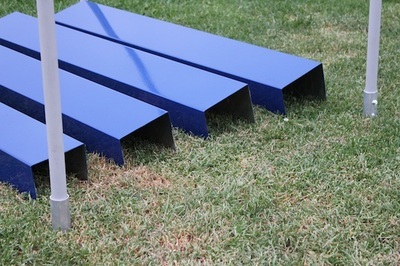 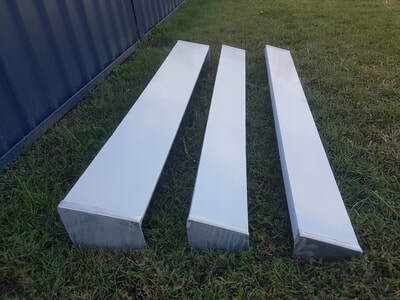 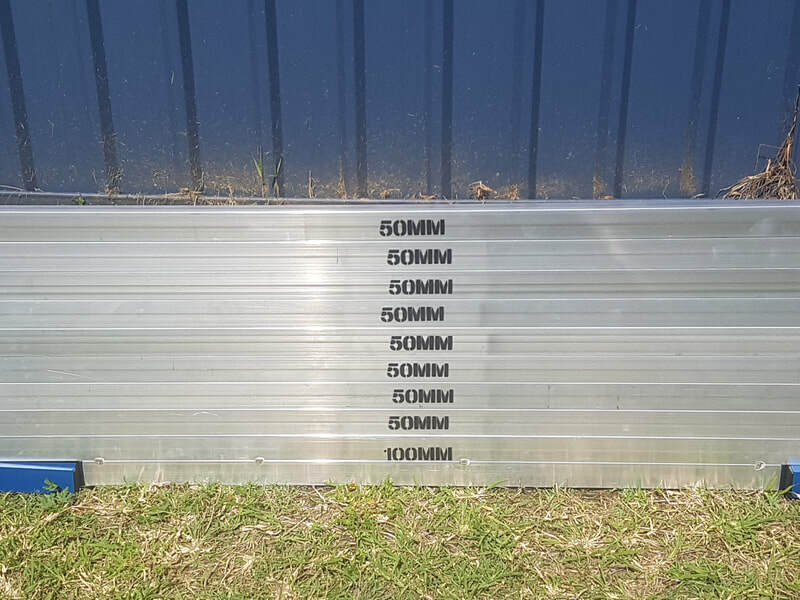 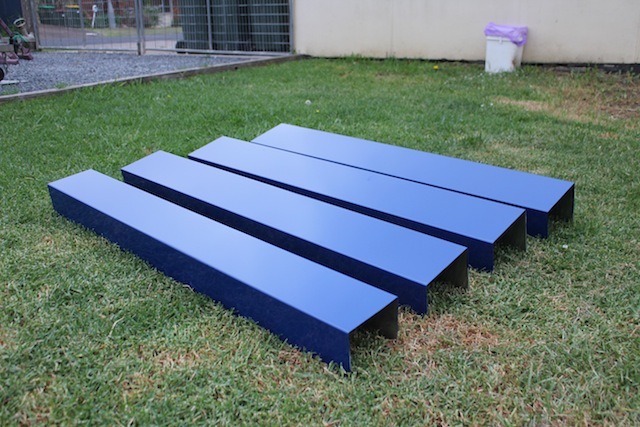 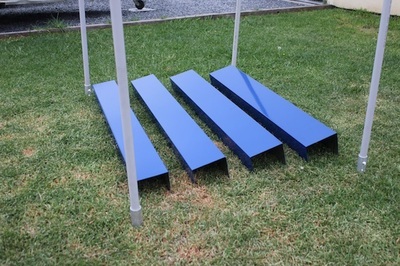 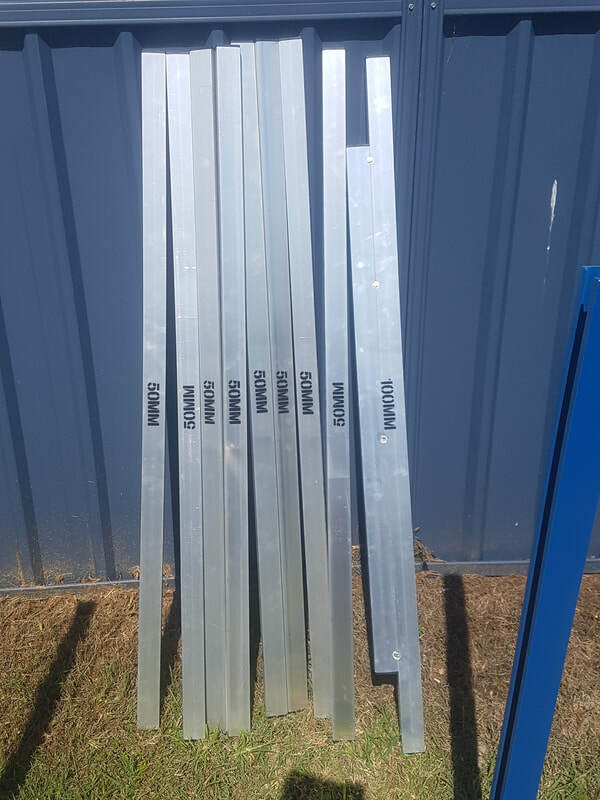 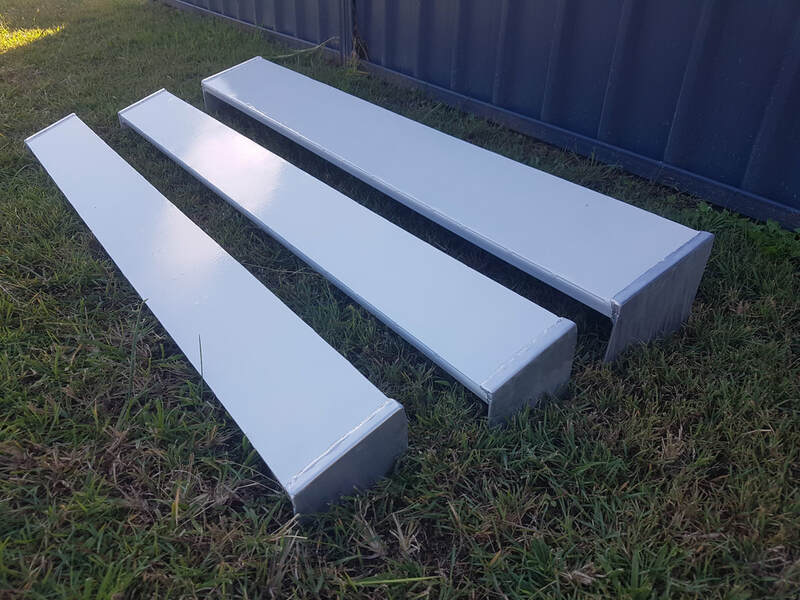 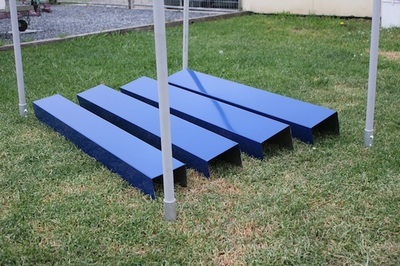 Aluminium Obedience broad jump set. 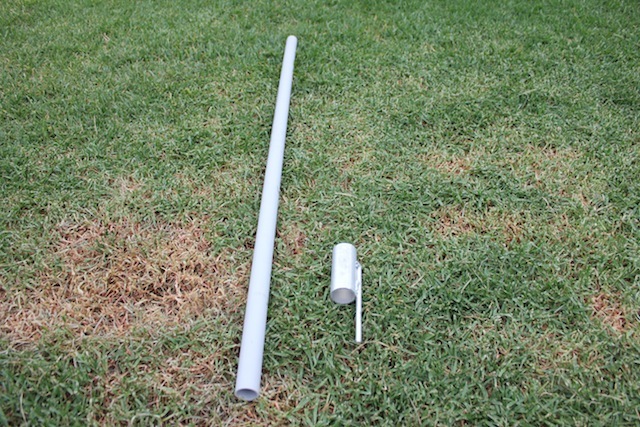 Comes with two aluminum uprights and pvc pole. 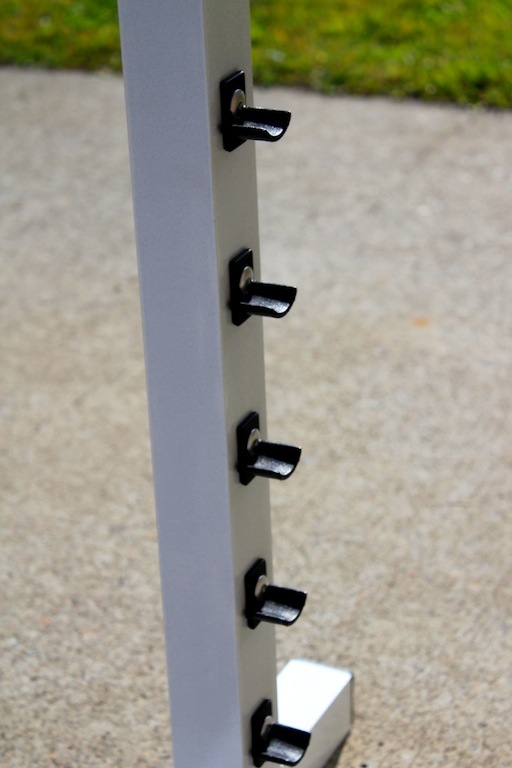 Clips for heights are attached, clips are from 'Cleanrun' and are made from pvc.